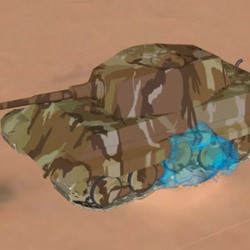 A previous blog article, titled Why Simulate When Developing Mine Protected Vehicles, provided motivation for using simulation in the development of mine protected vehicles. This article will now discuss an approach that is routinely adopted to perform these simulations. Mine blast events are highly dynamic (high frequency content) and non-linear. In addition they involve FSI (Fluid Structure Interaction). The mathematical model that is constructed to perform the analysis must adequately account for these factors. The problem is both time and space dependent, thus necessitating the application of numerical methods to both domains. The vehicle is modelled using the finite element method, where the structure is broken down into elements of constant mass. The mesh deforms along with the material using this approach and it is well suited when the materials have significant shear strength and do not undergo extremely large deformations. The air, soil and explosive which are involved in the blast are modelled using the finite volume method. Using this approach material flows through elements of constant volume that are stationary. This discretisation procedure is preferable when materials undergo large deformation, which typically happens with fluids (very little, or no shear strength). The two domains are then coupled to ensure FSI. The coupling algorithm allows finite element entities to act as a boundary to the flow of material within the finite volume domain, and conversely, that material in the finite volume domain exerts loads on the finite elements. 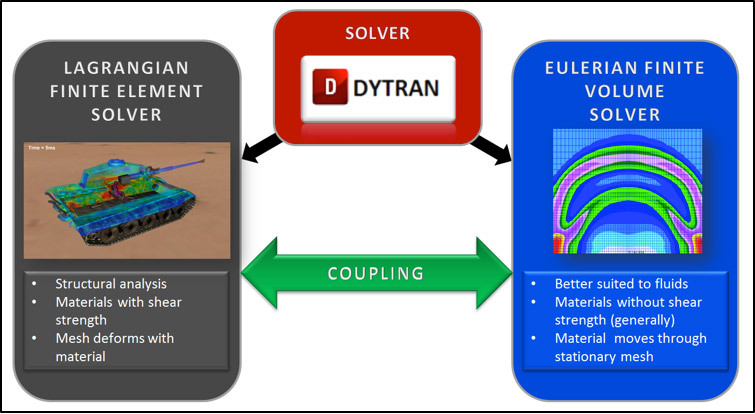 This solution approach, as adopted by Dytran, is illustrated in Figure 1. There are two primary direct time integration techniques that can be used, namely implicit and explicit methods. Implicit methods (as they are routinely implemented in commercial codes) have the advantage of being unconditionally stable. This means the time step that is taken by the solver can be chosen purely based on the highest frequency that has to be captured, and the solution computed will remain stable. The computational cost per a time step when implicit methods are used is relatively high compared to explicit methods. Explicit time integration methods are conditionally stable. This means that the time step taken by the solver has to meet certain criteria in order for the solution to remain stable. Typically this means a very small time step is required. The time steps of an explicit integration scheme are computationally cheap. This makes explicit time integration well suited to the analysis of events that are short in duration and require many very small time steps (high frequencies must be captured). Given the nature of mine blast events, explicit time integration is a good fit. It, essentially inherently, provides the necessary resolution at a reasonable computational cost. Although implicit time integration could legitimately be used, the computational cost would be significantly higher. In summary, a commonly used and effective approach to performing mine blast analysis is to employ explicit time integration to solve the problem in time, and coupled finite element and finite volume methods to solve the problem in space. In the next blog article titled Important Aspects of Mine Blast Analysis, things that can be easy to overlook when using the approach discussed above will be outlined.